Many people do not know it, but arthritis is not just one disease and there are actually over 100 different types of arthritis. Arthritis is a joint disorder, which causes inflammation, decreased mobility, and joint pain. One of the most common types of arthritis is Rheumatoid Arthritis. Rheumatoid Arthritis is different than most other kinds of arthritis in that it is an autoimmune disease and can progressively expand to other parts of the body. Not only can rheumatoid arthritis affect the joints, but it can also cause damage to other organs. Rheumatoid Arthritis is an autoimmune disorder, which means that it actually causes the body’s own immune cells to begin attacking the joints and organs. This autoimmune response develops after swelling of the joints develops. Soon inflammation begins and the swelling and inflammation crepes into the joints. This causes the cells in the joint to produce an enzyme that eats the cartilage and bones. The enzymes are released to counter a thickening of the joint membrane that occurs because of the swelling, but unfortunately they do not stop there and end up damaging healthy cells. Rheumatoid arthritis can be found in any of the body’s joints, but unlike most other common types of arthritis, Rheumatoid Arthritis almost always attacks joints symmetrically. So, for example, unlike osteoarthritis, which might only affect a single knee, rheumatoid arthritis would in all likelihood affect both knees. Many of the symptoms of rheumatoid arthritis are similar to most types of arthritis and include, joint pain, joint stiffness, inflammation, swelling, and limited mobility. Often, smaller joints, such as those found in the hands, are affected by rheumatoid arthritis. However, while rheumatoid arthritis shares a number of similarities with other kinds of arthritis, there are also a number of other symptoms that are more specific to rheumatoid arthritis. Stiffness and Pain of the Joints that exceeds one hour. An overall feeling of discomfort, called malaise, which can often times not be explained. Fever, Fatigue, and reduced Appetite. Pain after sitting for a long period of time. Dry Eyes and Dry Mouth, which is associated with Sjorgen’s Syndrome. Abnormal growth or build up of tissue. Rheumatoid arthritis is actually rather difficult to diagnose, because many of the other kinds of arthritis share similar symptoms. There is no definitive single test that can detect rheumatoid arthritis and instead, doctors usually consider a number of factors to diagnose rheumatoid arthritis. These factors include the actual condition and symptoms of the patient and their medical background. Blood work can also be preformed, which doesn’t actually test for rheumatoid arthritis, but instead looks for some problems that are often caused by the disease. 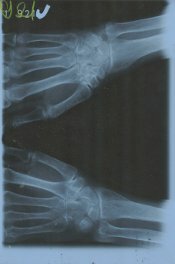 X-rays can also show joint damage, but in the early stages, X-Rays are not typically very effective. There is no known cure for rheumatoid arthritis, but if caught soon enough the effects can be minimized. Today, most treatments involve very aggressively treating the symptoms as soon as possible. The convention arthritis treatments, such as regular exercise and lowering bodyweight, play a role in the treatment of rheumatoid arthritis, as do a number of medications. The exact cause of the autoimmune response that triggers rheumatoid arthritis are not known, but many believe an individuals genes increase the risk of rheumatoid arthritis, which is then triggered by a specific event. Unlike osteoarthritis, rheumatoid arthritis is most common among 30 and 60 years old, although the disease has been found in people of all ages. Women are almost 3 times more likely to develop rheumatoid arthritis and the disease is also more common among smokers.